Home » »Unlabelled » The nurse laid the baby in the crib. When she looked at his face a few minutes later, she screamed in horror. The nurse laid the baby in the crib. When she looked at his face a few minutes later, she screamed in horror. Matvey Zakharenko is only two years old and doesn't yet understand that he looks a bit different than other children. Although he may have started to notice that some people aren't that willing to cuddle with him or give him a kiss like they do with other kids. And just like those other children, Matvey likes to play and smile and enjoy his mother's attention. As it looks today, he seems to have forgotten the horrible accident that nearly killed him and left him suffering agonizing pain. Matvey was born in November 2014 in Tula, Russia, about two hours drive south from Moscow. Except for a mild case of jaundice, he was a healthy baby boy. 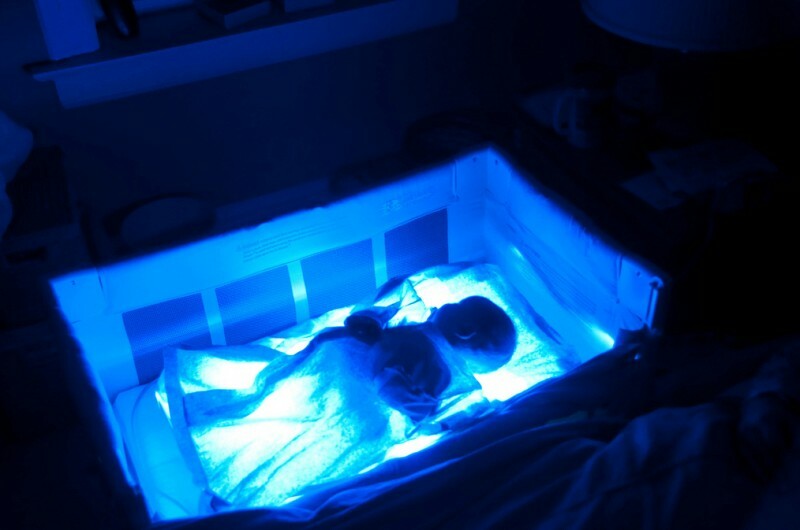 To treat the condition, doctors prescribed a form of light therapy that required Matvey to lie under a special lamp. Matvey was normally under constant supervision during this light treatment, but when his nurse decided to briefly leave the room, she couldn't have imagined the severity of the consequences. While she was gone, the lamp exploded and ignited a fire. 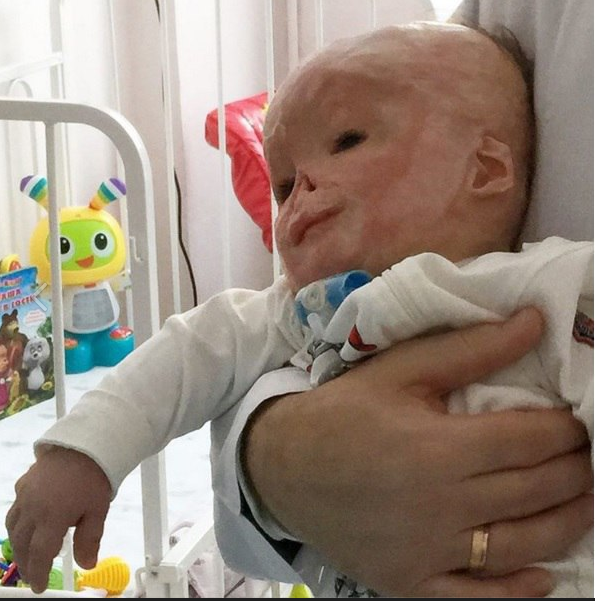 The nurse quickly rushed back into the room and extinguished it, but not before the three-day-old infant had suffered severe burns covering 75% of his body. His organs were also damaged. 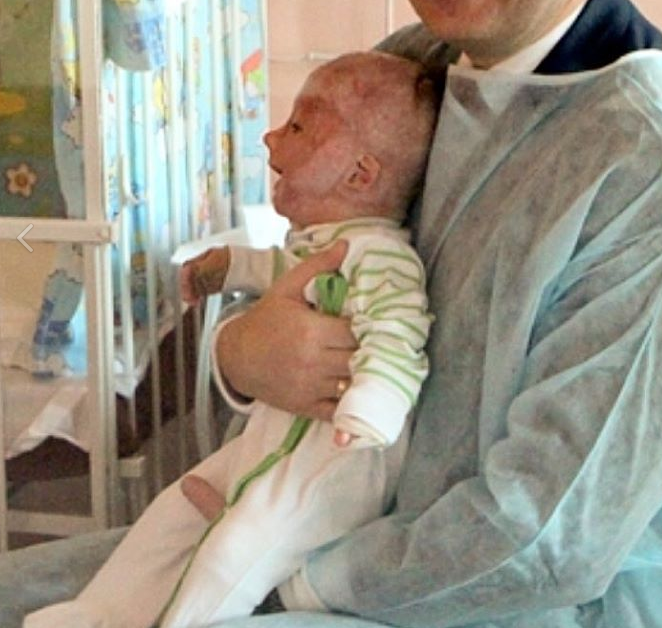 Matvey suffered excruciating pain as his skin peeled off, but he was a fighter and he survived. As if the fire wasn't horrible enough, an even greater tragedy struck the helpless infant. When Matvey's 19-year-old mother found out what had happened, she was devastated. She knew that he would require several operations and extensive treatments and still would never fully recover. To everyone's surprise, the young mother decided that she didn't want Matvey anymore. This decision was more of a shock than the accident itself. How could a mother turn her back on her child just when he needed her most? When news of Matvey's situation spread, volunteers, human rights activists, doctors and many others throughout Russia began working together to find the boy a new home. By the time Matvey was officially put up for adoption, the entire country knew his story. 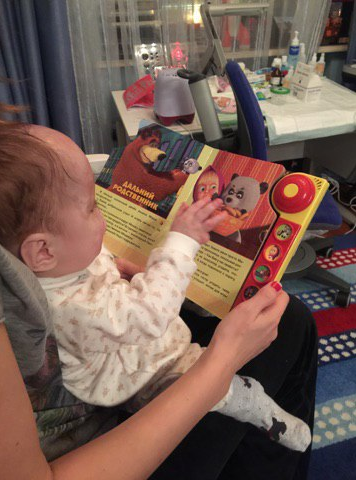 The media helped turn Matvey into something of a national celebrity and soon the best hospitals in Russia were offering their help. And more importantly, several families wanted to adopt the brave little infant. However, this unusual level of interest ended up complicating the situation. A full year after the accident two women were still competing to adopt Matvey, dragging the process out much longer than it should have been. And most unexpectedly, his biological mother also tried to regain custody when she saw how famous he had become. But the judges in Matvey's case decided that it was not in his best interests to be with his biological mother and granted custody to a woman from Moscow named Svetlana. Unlike the other potential adoptive parents, Svetlana had stayed well away from the media spotlight. She was not interested in any kind of attention or publicity; she only wanted to offer Matvey a safe and happy home. 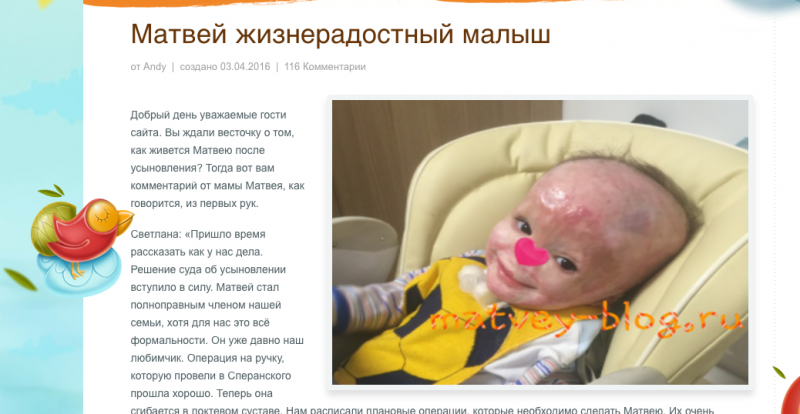 Sventlana knew that people throughout the country cared about Matvey and wanted to know how he was doing, so she started special blog full of news and pictures. "It's time to write and tell you how we're doing. The adoption process is complete. Matvey is now officially a member of our family, but that was just a formality. We've already loved him for a long time." Matvey has already undergone several surgeries and will require more. He can now move his hands, but plastic surgeons have not been able to reconstruct his nose so sometimes he wears a prosthetic. 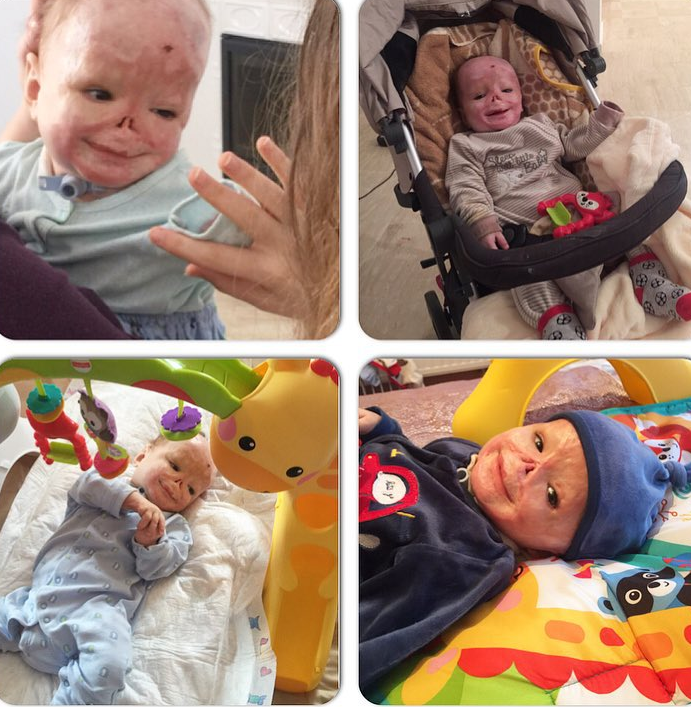 Despite all of the scarring, Matvey can still smile and he's been doing a lot of that since finding a new, loving family. At the age of two Matvey has already experienced more pain than most people suffer in a lifetime. His courage and will to live is truly inspirational and together with his adoptive family he can look forward to life full of love and happiness. Stay strong, Matvey, and keep smiling! I am so sad when I saw this poor little child who suffer this kind of pain. I was hoping and praying that he will be able to recover our from this heartbreaking pain that he has. this is something that we cannot have to ignore because it exactly look so helpless upon seeing this little child. I just hope to include this story in my writing with the http://www.urgentessaywriting.com/write-my-essay-for-me and put a lot of hopeful stories to everyone who will be able to see this content.